It's dumpling time again in the Baker house. If I could eat a selection of dumplings every other day, I would be a very happy camper, I just love them! I always make extra and tell myself I'll freeze the ones we don't eat...and that never seems to happen, we always end up eating them all! My sister was over a few weeks ago and we had a very busy day. The dinner hour was approaching and as usual I wasn't sure what to eat. I wanted to make her something yummy, however I opened a bottle of wine a little bit to early in the day and didn't leave myself much prep time for a lavish feast. I did however think of the next best thing and took her shopping. After deciding dinner was going to be something Asian we then went over our choices and chicken dumplings with lots of noodles and veggies was a hands down winner. 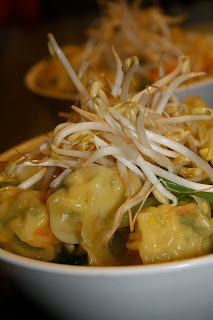 Once all the ingredients were gathered and another bottle of wine opened, I began preparing the dumplings. Tarsh grabbed a pen and paper and began jotting down the process. She did however fly back to Melbourne without the recipe, so this is the least I can do for all her hard work. I kept this meal quite simple as the boys were not in the mood for one of my 'experiments on flavour' nights and Tarsh can't tolerate to much chili (however I did add extra chilli to Nic and my dumplings). This is the beauty of the dumpling, you can fill them with anything really. If you have kids that are not quite up to your exotic tastes then make theirs a little mild and place on a seperate plate so you don't confuse them with your own. When all is said and done, you are sitting down for a family meal, however a few extra ingredients into your own chicken mixture will really set your meal apart from the growing palets of your kids. This recipe make 40 dumplings and easly fed 5 hungry people. Place the first 5 ingredients into a mortor and pestel, then pound until a paste is formed. Once you have a paste place chicken mince into a bowl, pour over the paste, add salt and mix to combine. If adding chilli remove child friendly portion first. Once mince is well combined, begin to make dumplings. I've missed you, Good to "see" you back! I simply love dumplings, I try to keep some wonton wrappers on hand yours look really nice, and sound wonderful. Welcome back! I am a dumpling addict, but usually too lazy to make them myself. Yours looks awesome! Sydney cooking school is open!